This checklist lists all so far in the Caucasus Ecoregion recorded spider species. A list of species with doubtful records, misidentifictions, invalid taxonomic status etc. can be viewed below the actual checklist: Jump to this section below. Records in Abdurakhmanov & Alieva (2009) refer to D. borealicaucasica. cf. Dysdera atra Mcheidze, 1979. Syn. E. cinnaberinus (Petagna, 1757). O. navus is often confused with O. annulipes, which occurs only in Algeria (cf. Kovblyuk et al. 2011: 37). Wunderlich (2017) resurrected the validity of H. gerhardti. Records of X. paradoxus from Abkhazia probably are misidentified H. flavidus (cf. Kovblyuk et al. 2011: 51), but Wunderlich (2017) resurrected the validity of H. gerhardti. Diagnostic drawings in Yoshida (1980), pdf available through WikiSpecies. Syn. A. beata (O. P.-Cambridge, 1906). Syn. E. capra Simon, 1884. All records of G. murcidum in the Caucasus seem to be misidentified specimens of G. vivum. All records of Meioneta (Agyneta) ressli in the Caucasus refer to M. mesasiatica, see Tanasevitch (2000). Female paratypes in Tanasevitch (1987) belong to Mansuphantes parmatus (cf. Tanasevitch, 1990). Syn. P. lativelum Tretzel, 1956. The record of Pelecopsis krausi in Ponomarev & Chumachenko (2007) is a misidentification of Scutpelecopsis wunderlichi Marusik & Gnelitsa, 2009. T. mengei can easily be confused with T. perseus (cf. Tanasevitch 2009). T. perseus can easily be confused with T. mengei (cf. Tanasevitch 2009). Some records in Abdurakhmanov & Alieva (2009, 2011) are misidentifications (see A. armida). In WSC 16 junior synonym of L. folium but see Mikhailov (2013). Records in Ponomarev et al. (2008b) refer to Geolycosa charitonovi. Cf. WSC 16: P. strigillata Simon, 1876 = P. tatarica (Thorell, 1875) (Zyuzin, 1979a: 444) or P. atomaria (C. L. Koch, 1847) (Buchar & Thaler, 2002: 446). Records in Ponomarev & Khalidov (2007), Khalidov & Ponomarev (2008), Ponomarev et al. (2008), Abdurakhmanov & Alieva (2011) misident. (see P. jaikensis). Records in Abkhazia by Mkheidze (1964, 1997) are doubtful/not confirmed (cf. Kovblyuk et al. 2011: 36). The name P. caraiensis for this species was derived from Qaraia, the historical name of Gardabani. Record from Kelasuri by Mcheidze (1997) is doubtful/not confirmed (cf. Kovblyuk et al. 2011:36). Records in Abdurakhmanov & Alieva (2009) and Ponomarev & Khatshikov (2009) refer to P. hurkai (cf. Abdurakhmanov et al. 2012). Compare with P. novicia, some records are based on misidentified material. Earlier misident. as P. segestriformis in Western Caucasus, cf. Kovblyuk et al. (2013: 72). Several similar species, cf. Abdurakhmanov et al. 2012: 20f. Records in SW Georgia need to be verified, cf. P. ovtchinnikovi in Kovblyuk et al. (2013). All records of C. frutetorum from the Caucasus and Kopetdagh Mts. should be ascribed to C. alpicola (cf. Mikhailov 2003: 288). This species can easily be confused with C. caerulescens, which probably does not occur in the Caucasus. see comment in Martynovchenko & Mikhailov 2014: 359 on Cl. similis. see comment in Martynovchenko & Mikhailov 2014: 359 on Cl. frisia. Syn. A. seminigra, in Ponomarev & Abdurakhmanov (2014) one record of juveniles from Tshetshen Peninsula. Compare with records of B. caspica for misidentified specimens. The record of G. caucasica from Lagodekhi in Mcheidze 1997 actually refers to G. mcheidzeae (Mcheidze, 1997). Genital characters of both males and females are hardly distinuishable between G. dolosa, G. saurica and G. jucunda (see Kovblyuk 2005: 141), determinations are in need of verification. Close to H. silvestris (cf. Ponomarev & Dvadnenko, 2013). Z. erebeus in Mcheidze (1997) is a misidentification of Z. khostensis, possibly also in other publications. Compare M. virescens and M. ligurina in Bayram & �zdag (2002). All records of P. aureolus in Azerbaijan are probably misidentifications (cf. Logunov & Huseynov, 2008:122,128). The record of P. cespitum in Dunin (1989) in Azerbaijan is probably based on a misidentification (cf. Logunov & Huseynov, 2008:128). All records of P. glaucinus in Azerbaijan are probably misidentifications (cf. Logunov & Huseynov, 2008:129) and should be referred to as P. medius. All records of T. arenarius in Azerbaijan are probably misidentifications (cf. Logunov & Huseynov, 2008:129) and should be referred to as T. kitabensis. All records of T. formicinus in Azerbaijan are probably misidentifications (cf. Logunov & Huseynov, 2008:129) and should be refered to as T. sabulosus. Possibly all records of T. maritimus in the Caucasus are misidentifications (cf. Logunov & Huseynov, 2008:129) and should be referred to as T. macellus. Heriaeus oblongus with Palearctic distribution, H. melloteei only in China, Korea and Japan (cf. WSC 16). Marusik (2008) resurrected O. o. balkarica to subspecies status with a distribution in the Caucasus Major. Ozyptila o. orientalis Kulczynski, 1926 is distributed from the Altai eastwards and Ozyptila o. basegica Esyunin, 1992 occurs in the Urals only. S. richteri Utochkin, 1960 is a junior synonym of S. plorator. Syn. Thomisus albus (Gmelin, 1789). Subspecies X. kochi abchasicus Mcheidze et Utochkin, 1971 might be a separate species (cf. Kovblyuk et al. 2011: 51). X. kulczynskii can be confused with X. ferrugineus Menge, 1876, cf. Logunov et al. (2002: 99ff.). Syn. X. cambridgei (Blackwall, 1859). Syn. X. umbrinus Utochkin, 1968. P. epularis may be confused with P. geniculatus and P. tocharistanus (cf. Logunov, 1999: 122). Can be confused with P. epularis (cf. Logunov, 1999: 122). Record in Minoranski et al. (1984) refers to S. tricinctus. 2. Dysderidae Dysdera cribrata Simon, 1882 According to Kovblyuk et al. (2011: 28) all records of D. cribrata from the Caucasus are based on misidentifications, see D. dunini. 3. Dysderidae Dysdera erythrina (Walckenaer, 1802) According to Kovblyuk et al. (2001: 28) all records of D. erythrina from the Caucasus are based on misidentifications. See also comments in Dunin (1992:71). 4. Dysderidae Dysdera kollari Doblika, 1853 Misident., see Dunin (1992:71), cf. Dysderella caspica. 5. Dysderidae Dysdera punctata C. L. Koch, 1838 See D. dunini, often misident., cf. Dunin (1992:71). 6. Dysderidae Dysdera westringi O. P.-Cambridge, 1872 Specimens often confused with D. lata, see Dunin (1992:71), probably not occurring in the Caucasus. 7. Dysderidae Harpactea charitonowi Mkheidze, 1972 Nomen dubium in WSC 16. 8. Dysderidae Harpactocrates bristawei Charitonov in Mcheidze, 1964 Species not mentioned in WSC 16. 9. Oecobiidae Oecobius annulipes Lucas, 1846 O. navus is often confused with O. annulipes, which occurs only in Algeria (cf. Kovblyuk et al. 2011: 37). 10. Oecobiidae Uroctea limbata (C. L. Koch, 1843) Occurrence in the Caucasus needs to be verified. 11. Theridiidae Asagena fagei Charitonov in Mcheidze, 1941 Different species than Steatoda fagei (Lawrence, 1964), not mentioned in WSC 16. 12. Theridiidae Theridion petraeum L. Koch, 1872 Only listed in Mikhailov Catalog, occurrence in the Caucasus needs to be verified. 13. Theridiidae Theridion swarczewskii Wierzbitzki, 1902 Occurrence in the Caucasus needs to be verified. 14. Linyphiidae Gongylidiellum murcidum Simon, 1884 All records of G. murcidum in the Caucasus seem to be misidentified specimens of G. vivum. 15. Linyphiidae Meioneta mossica Schikora, 1993 Occurrence in the Caucasus needs to be verified. 16. Linyphiidae Meioneta ressli Wunderlich, 1973 All records of Meioneta (Agyneta) ressli in the Caucasus refer to M. mesasiatica, see Tanasevitch (2000). 17. Linyphiidae Porrhomma lativelum Tretzel, 1956 Junior synonym of Porrhomma microps. 18. Linyphiidae Stemonyphantes abantensis Wunderlich, 1978 All records of S. abantensis in Tanasevitch (1987) are misidentifications of S. agnatus (cf. Kovblyuk et al. 2011: 33). 19. Araneidae Araneus zaitzevi Charitonov in Mcheidze, 1964 Species not mentioned in WSC 16. 20. Lycosidae Arctosa schenkeliana Charitonov in Mcheidze, 1964 Species not mentioned in WSC 16. 21. Lycosidae Pardosa berlandiana Charitonov in Mcheidze, 1941 Species not mentioned in WSC 16. 22. Lycosidae Pardosa condolens (O. P.-Cambridge, 1885) Occurrence in the Caucasus needs to be verified. 23. Lycosidae Pardosa jergeniensis Ponomarjov, 1979 Records in Guseinov & Rubtsova (2001) are misidentified (cf. Marusik et al. 2003b). 24. Lycosidae Pardosa kolosvariana Charitonov in Mcheidze, 1941 Species not mentioned in WSC 16. 25. Lycosidae Pardosa lagodechiensis Charitonov in Mcheidze, 1941 Species not mentioned in WSC 16. 26. Lycosidae Pardosa lessertiana Charitonov in Mcheidze, 1964 Species not mentioned in WSC 16. 27. Lycosidae Pardosa strigillata Simon, 1876 Cf. WSC 16: P. strigillata Simon, 1876 = P. tatarica (Thorell, 1875) (Zyuzin, 1979a: 444) or P. atomaria (C. L. Koch, 1847) (Buchar & Thaler, 2002: 446). 29. Lycosidae Trochosa saitzevi Charitonov in Mcheidze, 1964 Species not mentioned in WSC 16. 30. Pisauridae Dolomedes plantarius (Clerck, 1757) No record known in the Caucasus, but listed in Red List Georgia (2003). 31. Cybaeidae Cybaeus angustiarum L. Koch, 1868 All records in Caucasus probably misident. (cf. Nadolny & Kovblyuk 2011:223). See Paracedicus feti. 34. Amaurobiidae Pireneitega segestriformis (Dufour, 1820) Records in Western Caucasus misident., cf. P. ovtchinnikovi in Kovblyuk et al. (2013: 72). 35. Clubionidae Clubiona caerulescens L. Koch, 1867 All records in the Caucasus misident., see Clubiona caucasica. 36. Clubionidae Clubiona frutetorum C. L. Koch, 1867 All records of C. frutetorum from the Caucasus and Kopetdagh Mts. should be ascribed to C. alpicola (cf. Mikhailov 2003: 288). 37. Clubionidae Clubiona mcheidzea Charitonov, 1941 Species not mentioned in WSC 16. 38. Gnaphosidae Drassodes lacertosus (O. P.-Cambridge, 1872) Misident. D. chybyndensis and D. lapidosus. 39. Gnaphosidae Gnaphosa muscorum (C. L. Koch, 1866) Occurrence in the Caucasus needs to be verified. 40. Gnaphosidae Gnaphosa nigella (L. Koch, 1878) Described from Caucasus but nomen dubium, cf. WSC 16. 41. Gnaphosidae Gnaphosa reikhardi Ovtsharenko, Platnick & Song, 1992 only one record in Caucasus determined as 'Gnaphosa cf. reikhardi'. 42. Gnaphosidae Nomisia molendinaria (L. Koch, 1866) Occurrence in the Caucasus needs to be verified. 43. Gnaphosidae Talanites dunini Platnick & Ovtsharenko, 1991 Occurrence in the Caucasus needs to be verified. 44. Gnaphosidae Zelotes gallicus Simon, 1914 Occurrence in the Caucasus needs to be verified. 45. Sparassidae Micrommata ligurina (C. L. Koch, 1845) No verified records known from the Caucasus. Compare M. virescens and M. ligurina in Bayram & �zdag (2002). 46. Philodromidae Philodromus fuscolimbatus Lucas, 1846 The record of P. fuscolimbatus from Sheki-Zagatala (Dunin 1989) is probably based on a misidentification (cf. Logunov & Huseynov, 2008:128). 47. Philodromidae Philodromus juvencus Kulczynski, 1895 Occurrence in the Caucasus needs to be verified. 48. Philodromidae Thanatus lineatipes Simon, 1870 Records of T. lineatipes in the Caucasus are probably based on misidentifications (cf. Logunov & Kunt 2010). 50. 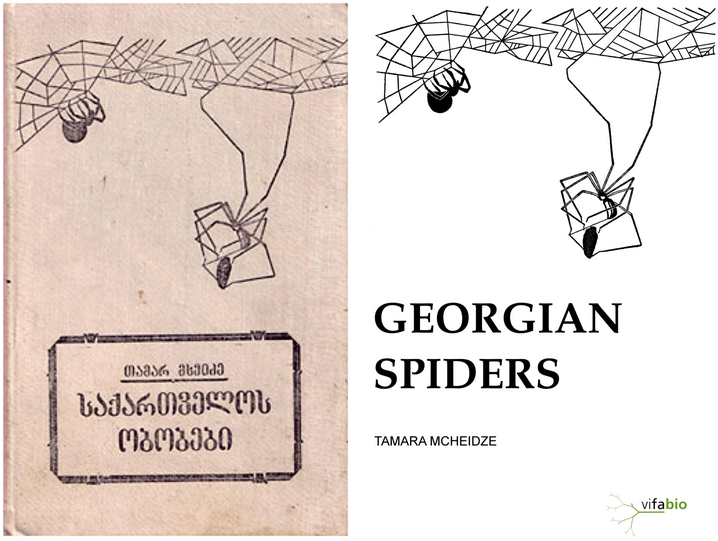 Thomisidae Heriaeus spinipalpus Loerbroks, 1983 Occurrence in the Caucasus needs to be verified. 51. Thomisidae Xysticus idolothytus Logunov, 1995 Occurrence in the Caucasus needs to be verified. 52. Thomisidae Xysticus nataliae Utochkin, 1968 Occurrence in the Caucasus needs to be verified. 53. Salticidae Aelurillus marusiki Azarkina, 2002 Determination needs to be verified. 54. Salticidae Heliophanus aeneus (Hahn, 1832) Occurrence in the Caucasus needs to be verified. 55. Salticidae Heliophanus forcipifer Kulczynski, 1895 Occurrence in the Caucasus needs to be verified. 56. Salticidae Mogrus fulvovittatus Simon, 1882 Occurrence in the Caucasus needs to be verified. 57. Salticidae Pellenes limbatus Kulczynski, 1895 Occurrence in the Caucasus needs to be verified. 58. Salticidae Sitticus avocator (O. P.-Cambridge, 1885) Occurrence in the Caucasus needs to be verified. 59. Salticidae Yllenus arenarius Menge, 1868 Occurrence in the Caucasus needs to be verified. 60. Salticidae Yllenus auspex (O. P.-Cambridge, 1885) Occurrence in the Caucasus needs to be verified.